ScoutParents, the National Parent Initiative of the Boy Scouts of America, was created to engage more parents and their children in Scouting. The emphasis is on capturing a parent’s interest and utilizing their talents and support to become more involved and committed to the success of their child’s Scouting experience. The initiative’s overarching goal is to increase recruitment and retention by registering 1,000,000+ additional Scouting youth and 1,000,000+ additional adults as ScoutParents or other dedicated Scouting volunteers. ScoutParents is the vision of lifelong Scouter Gerald I. Lawhorn. Gerald was diagnosed with the ALS/Lou Gehrig’s disease on June 6, 2005 at the age of 59. He completed the first draft outlining the ScoutParents concept thirteen days later and contacted the National BSA regarding his vision. After discussing the National Parent Initiative concept, National BSA saw the potential to enhance Scouting retention and recruitment for youth as well as their parents/mentors as volunteers, and committed to support a pilot roll-out in four of the more than 300 local BSA Councils. Gerald personally funded the development of the ScoutParents pilot program. The pilot was launched in four Councils in the southeast. 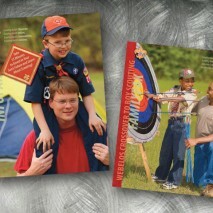 Following the successful pilot program ScoutParents was transitioned to National BSA in to be implemented nationally. STEEM, was hired to develop the marketing and communication strategy, branding and design and implement ScoutParents. STEEM’s plan included traditional and innovative methods for generating awareness, understanding and acceptance of the ScoutParents initiative. For its innovative work on ScoutParents, STEEM was awarded the Atlanta Business Chronicle’s MAX Award. STEEM also won a Telly Award for the ScoutParents recruitment video.